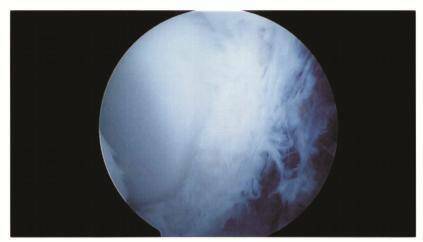 One of the most common causes of a “Snapping Elbow” is a Plica. A Plica is an inflamed and therefore enlarged portion of the elbow’s joint lining that catches in between the bones of the elbow during motion. 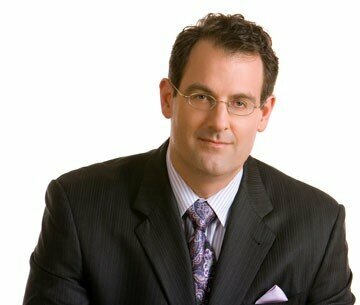 A Plica can be caused by anything that inflames the elbow, either a traumatic injury or overuse. Although symptoms may vary, the snapping from a Plica usually occurs when the elbow is bent approximately 90 degrees, with the palm of the hand facing away from the body (i.e. with the forearm pronated). The popping usually hurts on the outside of the elbow and may be associated with swelling. Other conditions that may cause elbow popping include loose bodies from arthritis, trauma, or Osteochondritis Dissecans (please see the ‘Osteochondritis Dissecans’ section for more information on this disorder). The diagnosis of an elbow Plica is best made on physical examination by a skilled Orthopedic Upper Extremity or Elbow Surgeon. A steroid injection placed into the elbow serves two purposes: 1) Diagnostic: if an injection into the elbow joint decreases pain, then the problem is located inside the elbow, 2) Therapeutic: the anti-inflammatory effects of the steroid injection may reduce the size of the Plica, decreasing its symptoms. While MRIs are very good at detecting arthritis, they miss Elbow Plicas 25% of the time, and cannot be relied upon to diagnose a Plica. 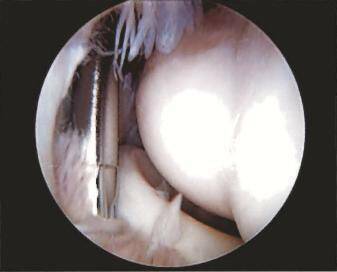 If the pain and snapping recurs following an injection, the Plica can be removed by Elbow Arthroscopy. Elbow Arthroscopy is a minimally-invasive outpatient procedure. 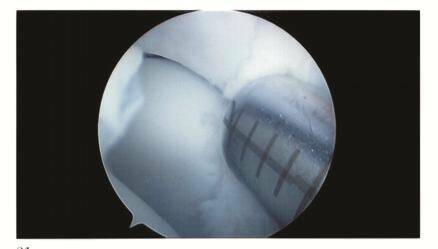 In order to maximize treatment results and minimize complications, this procedure should be performed only by experienced Orthopedic Elbow Arthroscopists. Please note that just because a surgeon performs arthroscopy of the knee and shoulder, that does not mean that they are skilled Elbow Arthroscopists. This is a separate skill set and requires a thorough understanding of the elbow’s complex anatomy. Please note that Plicas are usually located in both the front and the back of the elbow, and therefore plicas need to be removed in both areas of the elbow. After surgery, the elbow should be kept clean and dry for 2 days. After 2 days, the dressing can be removed and the elbow can get wet in a shower. At this point stretching should be started to regain full elbow motion; a hot shower is a great place to stretch out the elbow. The other hand can help take the elbow from full extension to full flexion. The forearm should be rotated from palm up to palm down. After showering, Band-Aids are applied to the arthroscopy portals. Submersion under water is avoided until the stitches are removed at the first post-operative appointment at 2 weeks. If full elbow motion has not been achieved by two weeks, therapy will be prescribed. In conclusion, painful snapping and popping on the outside of the elbow is often due to an inflamed Plica. 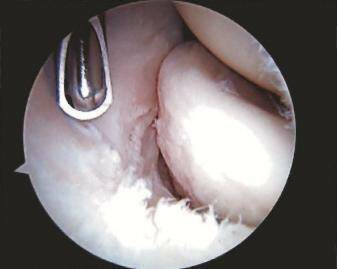 Fortunately, Plicas can usually be well treated by excision using Elbow Arthroscopy. Figure 1 shows the Plica and inflammation (which looks like reddish seaweed) at the front of the elbow. 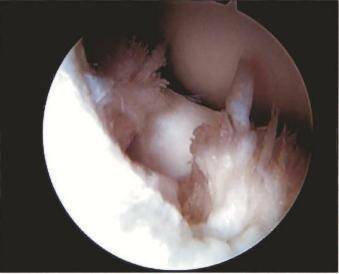 This inflamed tissue became entrapped between the bones of the elbow joint with motion, leading to painful snapping. Figure 2 shows a motorized shaver removing the Plica and its associated inflammation. Figure 3 shows the front of the elbow joint with the Plica and its associated inflammation removed. Figure 4 shows the portion of the Plica that lies in the back of the joint. 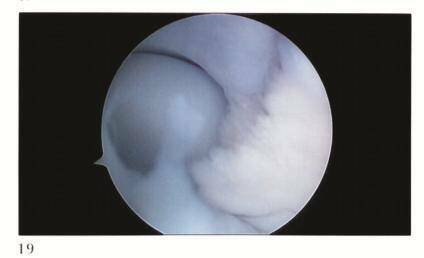 The Plica needs to be removed in both the front and the back of the elbow in order to fully treat it. Figure 5 shows the motorized shaver used to remove the Plica from the back of the elbow. Figure 6 shows the back of the elbow joint with the Plica removed.